Ready to do battle with the meanest of bull reds. Designed to hold up to 150 yards of 12-lb. test line, the Quantum Energy PTs Baitcast Reels feature a machined-aluminum frame and sidecover, a nine PT bearing system, a Micro ACS cast control, a smooth ceramic drag system, and a six-layer Saltgard corrosion protection system. "Quantum products have gone downhill they are way over priced for what you are getting . 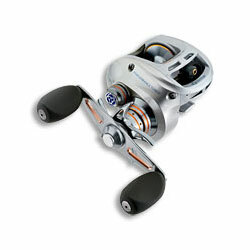 Dont make the same mistake I did , spend your money on a revo I love these reels , just a average joe trying to help the nex man." "I believe these reels are excellent."